Some quotes look familiar because they're asking the same questions, but looks like it's a new interview. They talk more about Rob. DonDeLillo: The character he plays is really close to the one in the book. I haven't seen Twilight, but I impressed my two 13 years old nieces when I told them the British Robert Pattinson was going to play in a movie adapted from one of my books. They respect me now! 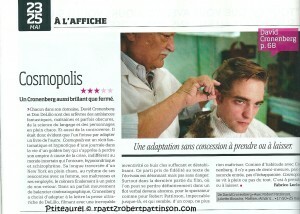 ETA: A Cosmopolis review from the French magazine Studio Ciné Live. They gave it 3 stars out of 5. 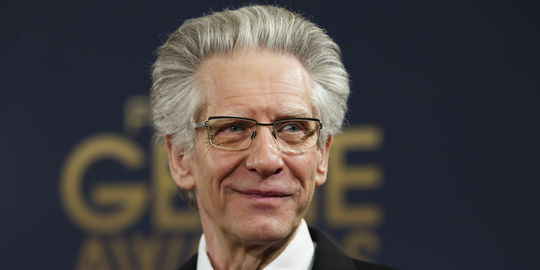 A Cronenberg as brilliant as he is firm. Each in their own genre, David Cronenberg and Don DeLillo are silversmiths of fantastic, unhealthy and sometimes dark atmospheres. As well as of the science of language and characters in shambles and - let's not forget - of controversy. It's then pretty obvious that one would end up adaptating the other's work. Cosmopolis is the ghostly and hypnotic story of a day in the life of a golden boy who is about to lose his empire because of the crisis, indifferent to the world that surrounds him. He's hypochondriac and schizophrenic. His long journey across a chaotic New York, rythmed by meetings with his wife, his mistresses and his employees, will lead him to a point of no return. In a perfect balanced cinematic movement, David Cronenberg decided to adapt to the letter the extremely rich prose of Don DeLillo. He filmed with an incredible ingenuity this stifling and unsetlling closed-door. This preconception to stay faithful to the text of the author is amazing but not without any danger. Especially in the last part of the film, where one could definitely get lost in a verbal flood that becomes complex for the viewer and for Robert Pattinson - who was perfect until then - but seems, all of the sudden, not to be able to manage anything anymore. As always with Cronenberg, there's no in between, no second place, no way out. Cosmopolis gets appreciated at full or not at all. Take it or leave it. Thanks to rpattzrobertpattinson for the scan. Thank you RPL for always providing the most up to date articles and information on Robert. Again the reviewer has not grasped the post modern reading of the book Cosmopolis nor how that reading translates to film. Unfortunately he is in the good company of academics and reviewers almost everywhere. Eric Packer does not LOSE his money. He disappears it much as Francisco d'Anconia does in Atlas Shrugged. To say Francisco LOST his money would have provoked outrage in Rand and her readers. No one sees that DeLillo is following Rand and leaving cookie crumbs all over the place so you will get it. He does it on purpose - just because he can. He turns over the tables of the money changers just as Jesus did, his last revolutionary act that brought him to his death. I have written lots more on my blog: cosmopolisfilm2 at blogspot. Even Cronenberg in his interview above says that Eric Packer destroys cyber capitalism in one day. DeLillo says it in his Krasny interviews on youtube. I bet Zizek will weigh in on this too. I certainly have. Packer leaves the limo and "lets the world will him" just as Jesus did. Neither were on the career path of LOSING it all, exdept in the Nietzschean sense. Biting Dead Skin off Your Thumb in DeLillo.Players: "He went to the smoking area, where he saw Frank McKechnie standing at the edge of a noisy group, biting skin from his thumb. "The Names (about Frank Volterra): "He wore dark glasses and kept biting skin from the edge of his thumb. He kneels to comply. Annoyed at such ready compliance, which implies pleasure, she stiffens her feet and kicks so her toenails stab his cheek, dangerously near his eyes.He pins her ankles to continue his kissing. Slightly doughy, matronly ankles. Green veins on her insteps. Nice remembered locker room taste. Cheap vanilla.